Captain Hook has been captured by the British navy and is soon to be hung. Since its publication in June of 2012, this original story takes you through Captain James Hook's rise to piracy, including his first confrontation with Long John Silver and his service on the Queen Anne's Revenge alongside Blackbeard at the Charleston Blockade. This book is not a retelling of the events of J. M. Barrie's beloved novel. It's a defense of the world's most famous pirate, told by the man himself. Captain James Hook and the Curse of Peter Pan is enticing from the first word. The description of Hook leads the reader into the book; “His eyes are so narrow that they never seem to blink” and he “smiles with everything but his eyes.” The authors create a fascinating character, dangerous but hypnotic. The first chapter sets the tone so well, not only of Hook’s character but all the great winks towards the Captain Hook you grew up with, like his pocket watch that ticks very loudly. As the story progresses, more and more familiar characters from Peter Pan enter and begin to play their part. The genius of the authors is that no one plays the part you expect. Is Hook the villain? Is Pan the hero? Side characters like Smee are also not as one would assume. The characters of this book incorporate more shades of grey and live in a morally ambiguous world. It would be difficult to discuss the plot without giving anything away. Trust me, this is one plot you want to uncover for yourself. It will hold your attention to the last word. 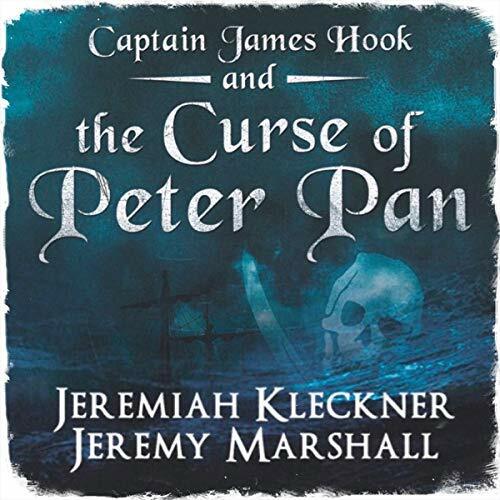 David Stifel’s narration of Captain James Hook and the Curse of Peter Pan was fabulous, one of the best narrations I have ever listened to. His voice can be honey smooth or dangerously sharp. Not only does he convey the personalities of the different characters, he does a fine job of conveying each character’s emotions. The authors need to sign him to a long term contract for this entire series. The production values of the audiobook were first rate. The sound is clear. There are no extraneous noises or changes in volume. I enjoyed this audiobook very much. I was not able to listen one day because of location so I purchased the kindle version. While I still liked the story, this is one situation where the audiobook brings a whole new dimension to a book. The narration adds precious gold and silver threads to the tapestry of the narration. For example read the line, “When I turned the body of my father, I expected the world to collapse around me but, strangely, it didn’t.” The lines could convey a total lack of feeling for a son for his father. But when Mr. Stifel narrates that line, it conveys a totally different emotion. It conveys a boy thrust into manhood through a traumatic event, a boy who has neither time or fear or grief because surviving has become the only thought. It really is a masterful narration. A swashbuckling tale of piracy and revenge in a creation of the back story of Captain Hook from the tale of Peter Pan. Like the Count of Monte Cristo it highlights the destructive nature of revenge and shows a man unable to accept responsibility for his own actions. A very good read if a little difficult to start initially. Best version of this story I've ever heard! This is definitely the best version of the Peter Pan story I've ever heard! The Authors did a great job and the narrator is amazing! This is a completely different twist on the classic story! You find yourself loving hook and hating pan. The narrator makes this book so much better. It reads like an old classic without it being written in an older English. Good dialect use to give the story depth. Hook comes off as reasonable. When you listen to this book as an adult you side with hook and you realize what an as Pan is. It's a good retelling with out it being the same story. This is one of his better performances. I enjoy listening to him; but he brought Hook's undoing to life. Hook went through a complete personality change. Life's events changed his personality and impacted him as we know him in JM Barrie's Peter Pan. This was a wonderful quick listen, rich within its well written and plotted story line! It really puts the whole story into perspective. The story is really good and the narrator does a great job. The only reason I give it 4 stars instead of 5 is because it kind of ruins my childhood. It is able to portray Cpt. Hook in a relatable and understanding light, and Peter Pan very much less so. Listen to this and I doubt you'll be able to look at either character the same way. Great job! What made the experience of listening to Captain James Hook and the Curse of Peter Pan the most enjoyable? Everyone likes the peter pan story line. This made it very new and different. The story line is from Captain Hooks point of view and how he became who he is. Finding out that Captain Hook and Peter Pan were friends when Hook was a boy growing up. Yes, after hook befriend Peter Pan you kinda get hooked on the story line. I just wanted to keep finding out what happens next. Than you get to a point in the book where you really understand Captain Hooks frustration with Peter. I didn't want to join the crew or anything but I did get where his feeling of being out to get the boy came from. David did a great job narrating the story line. He was very easy to listen too. He was great for helping bring out the feels of the story line the author wanted to share with us. I'm now a Cpt. Hook cheerleader! This is the story of how young bookish James Hoodkins became the wicked pirate Captain Hook. It’s a tale full of tricks, escapes, defeats, captures, treasure, Never Never Land, and lost love. After giving this book a listen, I, too, wanted to hunt Peter Pan down and tie him to the main mast. The story starts off in Port Royal in the Caribbean, probably in the 1600s or 1700s. At first, it reads a bit like a historical fiction, which I enjoyed. Young James is a scholarly kid and much more into books than into sword fighting or sailing. His mother quite enjoys telling him fantastical tales right before bedtime or during his bouts of illness. So, of course, when Peter Pan makes his first appearance in James’s life, he has no problem believing. James’s father is not the coddling sort and makes a final decision, against the wishes of both wife and son, to take James on his next sailing venture. James’s best friend will be going with him, so at least he has that. James makes a sweet farewell to his friend (and perhaps more than friend) Emily. As you might imagine, the venture doesn’t go as planned and little by little we see how the quiet, timid, sweet James Hoodkins turns into the bold, wretched, determined Captain Hook. There’s death and romance, sword fights and alligators, pirate treasure and the English Navy. The fantasy elements are firmly grounded in events that could have really happened in our world. This lent a gravity to the story that made me appreciate it all the more. I read Barrie’s original Peter Pan novel sometime ago. I enjoyed it, though it was written for its age and contained touches of racism and sexism. It was very refreshing to have all the awesome bits of the tale without the disappointing bits in this fascinating retelling. There are only two female characters in this tale but the authors write them well. We only get a few glimpses of James’s mom but she is her own character. We see much more of Emily and she has even more personality. Both women leave an indelible mark on the man who becomes Captain Hook. I received a copy of this audiobook at no cost from the narrator (via Audiobook Blast) in exchange for an honest review. Narration: David Stifel did an excellent job bringing this story to life. Over the course of the book, James goes from a pretty mellow kid to a hardened pirate. Stifel hardened the character’s voice as the tale went along and that was well done! He also had this great voice for Peter Pan being a youngish, mostly oblivious voice. His female character voices were believable.